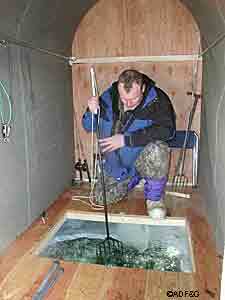 Shaped and colored like a small pike, a decoy hovers in the water just below the hole in the ice. Shaun Fett gently pulls on the attached string and then lets it go; the decoy propels forward and makes a sweeping arc back to the center of gravity. The movement is sure to attract nearby northern pike. Shaun is crouched on one knee waiting, his four foot long spear poised and the seven-pronged spear head is a few inches below the surface, ready for a pike to appear. The hole in the ice is a 2 foot by 3 foot opening. 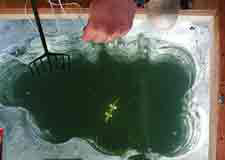 The interior of Shaun’s icehouse is small and dark but the sun glows brightly through the ice, the water is a mossy green, and the bottom of the lake is twelve feet below. Suddenly, a fish glides into view and disappears just as quickly. “Not ready for this one,” Shawn breathes out loud. Using a spear to catch fish is not nearly as common in waters of the Interior as it once was. However, the practice lives on during the winter, in icehouses or “darkhouses” as they are fondly known in northeast states. Slowly moving forward, another pike comes into view attempting to catch the decoy by surprise. A foot away it explodes forward, grabs the decoy and gives it a good thrashing. In a fluid motion Shaun thrusts the spear down. The middle spear points pierce the back of the pikes head. Shaun regains hold of the spear handle by yanking on the braided nylon line tied to its end, and “reels” in the pike. Through the ice lens, the whole drama plays out like the movie “jaws,” and your heart mimics the du-duh, du-duh as the predator makes its move. Moving back away from the action in the water, you see the fisherman bathed in the ghostly light coming up through the ice, hardly realizing you’re in a confined space. The darkened interior allows your eyes to become accustomed to the low light and makes the action in the water appear close at hand. Northern pike can be thought of as a prehistoric ‘mean-o-saurus.’ Its elongated snout with plates of sharp teeth, not unlike sharks, can tear into another fish like a paper shredder. Eyes perched nearly on top of its armored skull enhance the pike’s primeval appearance; the fish appears safer on the end of the spear. Spear fishing is no boring day on the ice. The excitement exists on several levels; the thrill of the hunt, visual contact, a primal instinct, to name a few. The experience, in no way, compares to fishing with hook and line gear. Long ago, before hook and line were used as angling tools, when humans got tired of clubbing fish they extended their reach using a long pole with a sharpened tip to spear their prey. In was just a matter of time before they would create decoys, perhaps fashioned out of bone or tusk, to attract the fish and lure them within reach. Today’s decoys are spitting images of prey species, usually carved out of cedar, weighted and painted brightly, with the fins carved to promote erratic motions in the water. Shaun grasps the spear handle firmly and asks that the door be opened. The writhing fish of about 30 inches is put out in the snow. Wow! As soon as that door opened the brilliant sun off the snow is a shock to the eyes. Soon the fish is de-speared and Shawn goes back to stalk the next one. Shawn’s partner Rick Johnson has started filleting fish and I asked him how difficult it was to remove the infamous “Y” bones that pike have. Rick said, “It doesn’t matter, we are pickling this batch, the bones are edible when the pickling is done.” Fishermen who clean northern pike for immediate consumption usually take care to remove the bones. Experts start by making a cut from between the front fins to the vent. Next lay the fish on its side and fillet the two halves like you would any fish using a sawing motion from the head to the tail and being careful not to cut through the backbone. You will cut through the rib bones in the process. Remove the belly fin. Now use your finger to locate the rib bones, place your thin-bladed knife right behind the bones, turn the knife outward (toward the belly) to cut alongside the bones with long, steady slices. After slicing about three-quarters underneath the ribs, hold down the fillet with your knife point and grasp the ribs and pull them out. Sound easy? This is going to take practice. Not all spear fishing is done for northern pike in the interior of Alaska. Spearing for cisco’s, humpback and round whitefish species was very popular in the 1980s on the Chatanika River near the Elliot Highway Bridge. In late September and through October one could see dozens of lanterns from spear fishermen wading in the river with 10 foot poles. Whitefish are caught at night when they are heading upstream to their spawning grounds. Whitefish are small, barely a pound, and fishers generally freeze their catch and use them as bait during the summer or as dog food. Perhaps it was more for the thrill of spear fishing that many people participated in this fishery. After all, who would turn out in freezing temperatures, occasionally burning holes in their clothes from hot lanterns, or slipping in a deep hole and being immersed in the river? 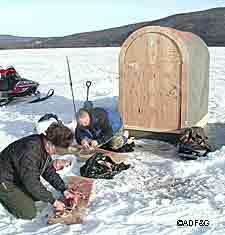 In the lower 48 states, spear fishing thru the ice is traditional in Minnesota, Wisconsin and North Dakota. Spear fishers have organized themselves to protect their way of life, and to promote annual derbies, handmade decoys shows and other festivities. Even though this spearing enthusiasm has not caught on in Alaska there is opportunity, and those like Shaun and Rick enjoy every minute of it. James “Fronty” Parker is the Upper Tanana Area Management Biologist for the Alaska Department of Fish and Game, division of Sport Fish Division, based in Delta Junction.